My studio is overflowing with paintings, my walls are covered, and it is time to start letting go of some of my favorites. This 8x10 inch landscape is one to which I am finally willing to say good-bye. It was created this past year as part of the Different Strokes Challenge. The original challenge involved a black and white photo to which participants were to add a color interpretation. The combination of purple and green creates a lovely summer warmth that I wanted to hold on to for a long time. But, as fall approaches and my studio is brimming with work, it is time to let go. This painting is for sale at Impressions Gallery for $125.00 plus $12.50 for shipping to US addresses. It is time for it to bless someone else's home with its summery atmosphere. 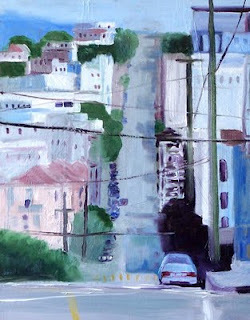 My challenge in this 8x10 inch oil painting was getting the perspective on the buildings accurate. With a very simple subject, my focus was accuracy. Usually I start working on the distant subjects first and progress forward. This time I began with the buildings, concentrated on getting the perspective and color right, and then filled in around the buildings with the trees, sky, road, etc. The claim by many successful landscape painters that one should paint the focal point first seems to have worked in this instance. My question is, was it a happy accident that the buildings emerged correctly or was it because I painted them first? A few more paintings with the focal point first approach might give me an answer. In an effort to resolve the question for myself, I'll be thumbing through my refernce photos and paint a few more of these simple architectual paintings. 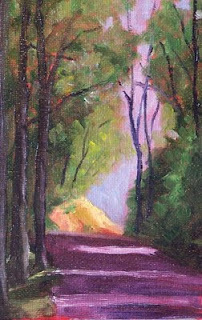 Yesterday I took inspiration from a smaller plein air painting to create this 11x14 inch oil painting on stretched canvas. The original study was 5x7 inches and is for sale at Small Impressions Gallery for $35.00 plus $6.50 shipping to US addresses. It recorded enough of a glorious day at a woodland park that I wanted to relive it again. A wash of Burt Sienna added the warmth the summer afternoon had provided. Yellow Ochre and Naples Yellow were great colors for creating the dry grass that covered the ground. When this painting is dry, it will probaby make a temporary home at Impressions Gallery with some of my other landscape oil paintings. A request for a reproduction of this original painting prompted some research on making prints of my original paintings. What I discovered is that, not only is there a very large learning curve for doing this, I don't have any of the equipment I need to do it myself. The camera I own does not produce images large enough for quality reproductions and I have a clunker of a printer. For now, the idea of reproductions is on hold. I decided the first order of business is to buy a new camera. So, research continues with a digital SLR is on the horizon instead of my little point and shoot. 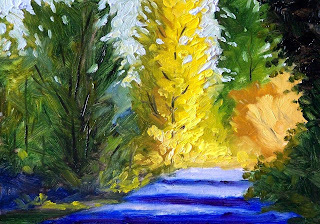 Today's painting is an 8x10 inch impressionistic landscape based on a group of trees on the edge of the Carbon River in Washington State. Painting spots of color on a red underpainting worked well. I like the contemporary feel of this painting and am interested in working more in the contemporary, abstract direction. I like doing these small paintings as a way to audition new ideas. Sometimes they become larger works and sometimes they remain small one of a kind paintings. I haven't determined what will happen to this one yet. Today's painting is not one of my usual subjects, but it really was fun to paint. This Ford Model A car was parked at a street fair I visited earlier this summer. I snapped a picture and forgot about it until this morning. As I was sifting through some of my photos it smiled at me and asked to be painted. I wouldn't have known what kind of car it was except it had a little sign on the front grill that identified it as a Ford Model A. 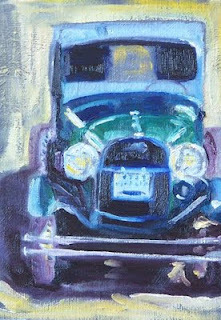 As I painted, I tried to concentrate on duplicating the shapes rather than painting a car. I'm not sure it is perfectly proportioned, but it was fun to attempt something new and different. The painting is 5x7 inches on a canas panel. It will probably be sold in the affordable canvas panel section of the Small Impressions Gallery when it dries. 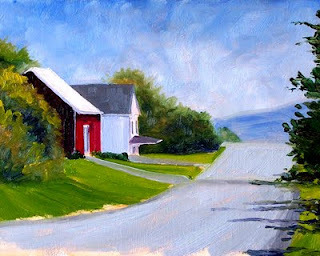 Riding my bike through rural areas of Washington State provides plenty of inspiration for my painting. 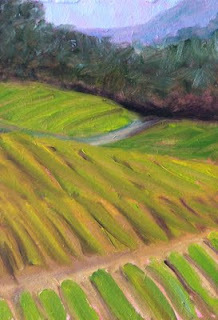 This 5x7 inch oil painting was inspired by a recent ride on the Foothills Trail of Washington State. It passes farms, forests, and a glacial river. I love the variety of scenery experienced on this ride. Many people call this path the Silk Road because it is so smooth and such pleasure to travel. As one of the rail-trails, we can thank the railroads of the past for creating this wonderful opportunity for walkers, hikers, and bicyclists. This little painting is for sale at Small Impressions Gallery for $50.00 plus $6.50 for shipping to US addresses. This has been a busy month for exhibitions of my art. There is just a little over one week left to visit the Auburn City Hall Gallery in Auburn, Washington and see my paintings in the Good Ol' Days Show. 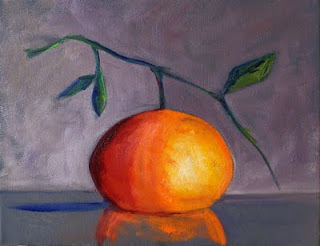 This 9x 12 inch tangerine painting among others will be on display until August 31. 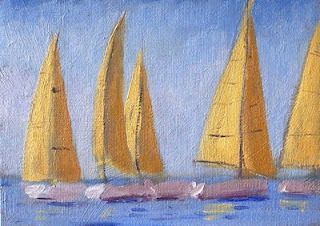 Beginning August 20 and running through September 13, visitors can see two of my maritime themed paintings at the Maritime Fest Art Show in Tacoma, Washington. And lastly, beginning October 6 through November 12, two more new paintings will be showing at Gig Harbor Civic Center in Gig Harbor Washington. If you are in the Pierce/King County area of Washington State during the next few weeks or months, I hope you will have an opportunity to stop by a see some of my paintings. If not, a collection is always available for sale in the Small Impressions Gallery at Etsy or Impressions Gallery at 1000 Markets. 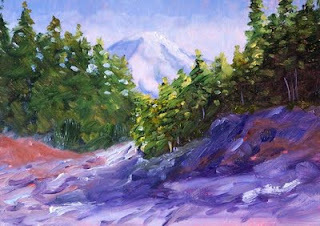 Yesterday I was in need of a little paint therapy and there is nothing like plein air painting to make the day seem brighter. The saga began with a rescue dog that didn't work out. My husband and I were offered ownership of an Australian Shepherd whose owners could no longer keep him. My daughter owns a lovely Aussie who is a great pet, so my husband and I figured Jackson might be a good match for our family. Jackson moved in so we could get to know each other. He was affectionate and calm. He hung around, loved a good scratch on the ears and we thought all was well. However, later in the day, he nipped at the appliance repair man, snarled, growled, and nipped at my son, wouldn't let him in the house, then attacked my daughter's dog. We realized he was much too territorial for our household and gave him back to the original owners. We were sad and felt like failures as adoptive parents. Paint therapy was in order. I packed up my pochade box and headed for the park. The fresh morning air, the quiet breeze, and the sunshine helped to heal my disappointment. This 5x7 inch painting resulted from my trek to the park. A dilapidated old barn, hidden by trees served as my subject and put a new light on my day. Paint therapy works wonders in healing a wounded soul. Here he is, the rooster that saved the canvas! Let me tell you how. When I paint larger paintings, sometimes I will work on a hand-stretched canvas because the quality is superior to purchased canvases. The difficulty is that it takes a lot of time to make the stretcher bars, stretch the canvas, and prepare the surface. I don't practice on my hand-stretched canvases, but save them for really special paintings. Now--how the rooster saved the canvas. This particular 18x24 inch canvas was to be the surface for a landscape painting that I had created in an 8x10 inch size and decided I liked it so much that I would enlarge it. The lesson I should have remembered is that not all small paintings work well in a larger format. I didn't consider the composition fully and recognize it was the color that attracted me. When I was finished, I didn't like the painting. It just didn't translate well into larger painting. I lamented a while, tried to alter it several times, and still didn't like the results. I painted over the entire painting, let it dry and had a new surface for a new painting. I painted a second landscape on the surface, but once again I didn't really spend the time I should have planning my design. A painting emerged that was not satifactory. I painted over the design. The blank canvas sat in my studio for weeks while I tried to decide whether to take the canvas off the bars, restretch, and begin with a fresh canvas. 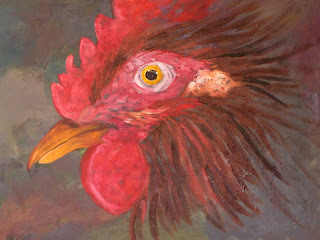 Then, in a moment of devil may care, I began to paint this rooster. The background of neutral grays, the texture left from the previous paintings, and his evil determination saved the day. He is going to hang in my studio for a while as a reminder to plan carefully and never give up. As September approaches, families are getting ready for school and mothers are looking forward to some extended quiet time. 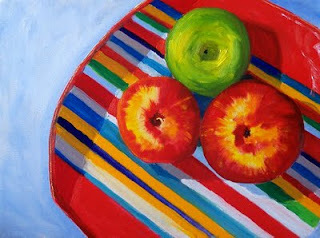 Painting this bright little still life oil painting was fun. 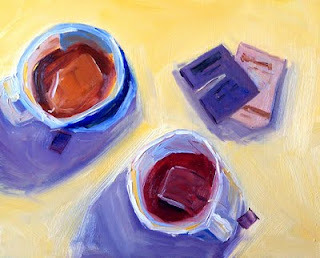 The loose brush strokes and the bright colors made me relax and imagine the feel of a cup of tea and a quiet moment. This 8x10 inch oil painting is for sale at the Small Impressions Gallery for $125.00 plus $12.50 for shipping to US addresses. 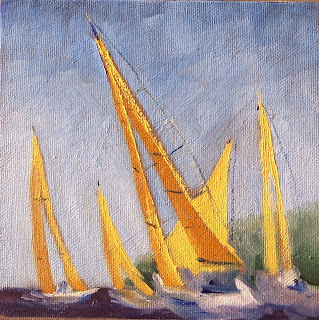 This little painting is the second in my current series of sailboat paintings. I wish the paint on it and its companion painting were dry so I could enter them into the Maritime Fest Art Show in Tacoma, Washington along with several other maritime paintings that I will be entering this weekend. The Maritime Fest runs August 20 to September 13 on the waterfront. When these two little paintings dry, I will eventually sell them in the Small Impressions Gallery at Etsy or enter them in next year's competition. Recently I was reminded of an afternoon my husband and I spent on the waterfront of Commencement Bay on Puget Sound. Unexpectedly a sailboat race was taking place. It was a delight to watch the abstract patterns created by the sails as they traversed the bay. Translating some of those patterns from my memory to the canvas was fun. This little painting is 6x6 inches on a canvas panel and is one of two small paintings I created yesterday. Today I'm considering transferring some of my ideas to a larger canvas and experimenting with some additional compositions. Yesterday morning I had the opportunity to get outside and paint after several days of heavy clouds, thunder storms, and rain. My summer attitude was hiding, so it was good to recover a bit in the fresh morning air. Visiting Fort Steilacoom Park was exactly what I needed. I chose to venture into the natural woodlands for my painting exposition. Light on a tangled tree caught my attention and I set up to paint. The air was fresh from the recent rains. It felt good to paint. When the paint dries on this little 5x7 canvas panel, it will be offered for sale at the Small Impressions Gallery along with some of my affordable canvas panels. During college, I spent several years living in the Polouse region of Eastern Washington State. It was a big change for me having lived my entire life in the moist coastal region of the Pacific Northwest. The empty grasslands and lack of evergreen trees disturbed me at first, but after a few years, I began to appreciate the beauty of the new landscape. 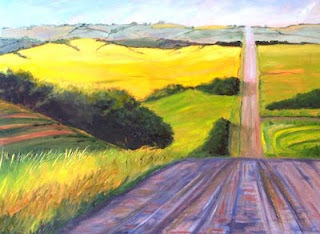 This 18x24 inch landscape painting was inspired by the rolling landscape of Eastern Washington. I began this painting with a small 5x7 inch study to get the design and basic colors established. After determining the design would work, I translated it to the larger canvas. I have been tweaking it for several weeks now, but am finally going to call it quits and stop dabbling. This fall it will be put up for sale at Impressions Gallery or entered it into a regional art show. 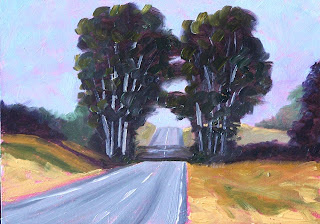 The small study I used to help me get started on this painting is for sale at the Small Impressions Gallery along with other small 5x7 inch studies. Today's subject is Mount Rainier in Washington State as seen from the Nisqually River bed when you enter Mount Rainier National Park. 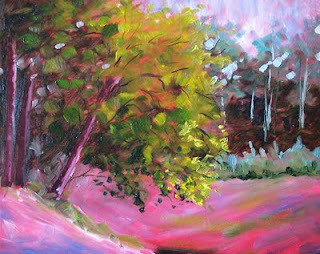 The park is full of lovely landscapes and options for landscape painting. This weekend will be an especially good weekend to visit because it is one of the national fee-free weekends where the park admission fees of $3.00 to $25.00 are waived. The weather is predicted to be improving with temperatures in the 70's--not too hot--not too cold, but just right for a comfortable visit. The painting is 5x7 inches on a gessoed hardboard panel. Although it is not yet for sale, I will list it at the Small Impressions Gallery with other small landscape paintings in the future. 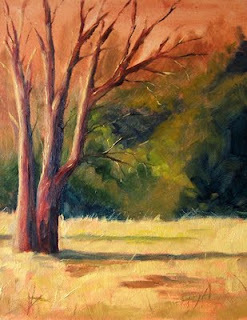 Today's little 5x7 inch painting was inspired by a tree beginning to show its fall colors. Walking in a local park, the sun shone on it in such a way that it is clear autumn is just around the corner. Although I hate to see the long days of summer disappear, this sparkling tree was a relief from the acres of green and high temperatures. When the heavily textured paint dries, I will sell this painting at Small Impressions Gallery along with some of my other small landscape paintings. Farm animals have been on my mind lately--perhaps it is the bike riding I've been doing-- passing luscious fields of rubarb, strawberries, and grazing animals of all kinds. Nothing like summertime on a bike to bring out the country in a suburban dweller. This curious cow was certain I didn't belong in her neighborhood. She was painted in oils on a 5x7 inch gessoed hardboard. Her purchase price is $50.00 plus $6.50 for shipping to US addresses. 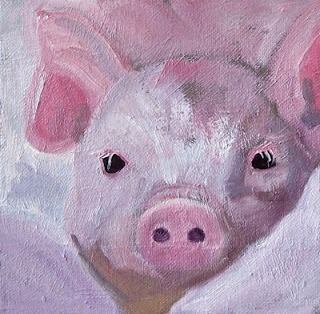 The animal paintings section of my Small Impressions Gallery is where she is residing for the time being. 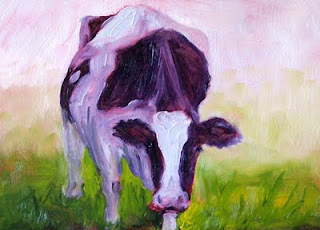 I've been painting all kinds of animals for the last couple of days, so the barn will be filling up soon. This morning I enjoyed bringing this little fellow to life. He is painted in oils on a recycled 6x6 canvas panel. The texture of the panel was perfect. Beginning with his eyes, every paint stroke brought character to him. When I was finished, it was difficult not to like his cute little face. He sold quickly at my Small Impressions Gallery at Etsy. Yesterday I took a break from painting landscapes and did a fun little still life. This 8x10 inch oil painting was a delight to paint. The brilliant red of the Snapper especially attracted my attention. With their large eyes and sparkling scales, I couldn't help but have a little fun recreating them with paint. 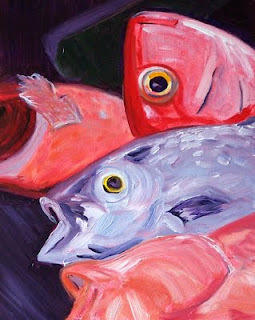 My father used to be a commercial fisherman and I spent many summers with him hauling in the lovely colors of the sea. This painting helps me recall those fond memories. One of the sights that I find most beautiful when I'm out and about in rural areas is the subtle colors of a meadow. If I look closely it becomes clear that those meadows really aren't just green as they might first appear. 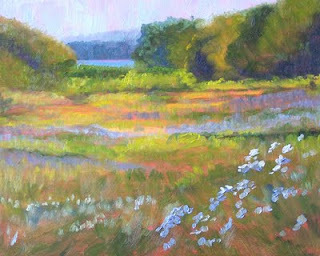 Instead there is a multitude of subtle colors--wild grasses and flowers. One of my challenges as a painter is to create a painting that displays those subltlties. 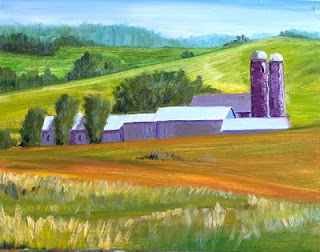 This 8x10 inch oil painting is my latest attempt at painting one of those beautiful meadows. 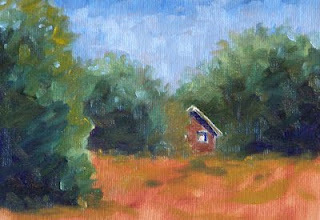 Today's painting is 4x6 inches on a canvas panel. The title is metaphoric for me because I have recently purchased a pochade box for outdoor painting and I am imagining some happy times painting outside. I'm headed down a new road and expecting to enjoy it. In the summer months I do a lot of bike riding and have always longed to take my painting with me. My supplies and portable tripod fit nicely into a backpack, so I will take them with me when scenic destinations are on the agenda. 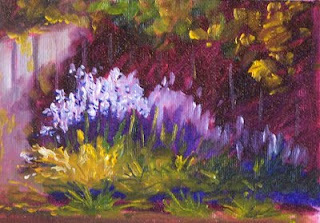 This little 4x6 inch oil painting has sold, but other small paintings are for sale at the Small Impressions Gallery . An don't forget to check out more affordable canvas panel paintings. While I'm continuing work on my Oaks on the Road painting, my backyard harvest is beginning to arrive on my kitchen table. I love the colors of fresh produce--red, green, yellow--mother nature really knows how to serve up her beauty. 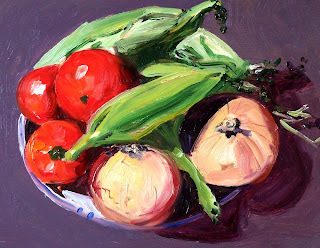 This 8x10 inch oil painting was fun to paint with the splashy red tomatoes, fluid green of corn husks, and the papery skin of the onions. This painting is now for sale at Impressions Gallery for $125.00 plus $12.50 to US addresses. If you live outside the US and are interested in purchasing this painting, please e-mail me. For the past few of days I've been working on scaling up my oak tree painting. Here is a work in progress shot after the first day of painting. The basic design and the underpainting are going well on an 18x24 inch canvas. Still not finished; I will keep refining today and be finished in another day or so. 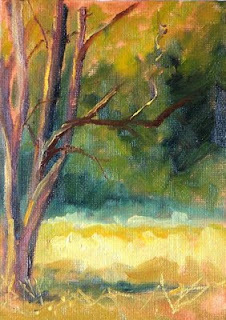 Today's study is a 5x7 inch oil based on the White Oak trees that populated my neighborhood as I grew up. Until I moved away from home and added some experience to my life I didn't appreciate these towering beauties. They are very slow growing and it takes about 20 years of growth for them to produce acorns. As a child we probably had 15 or 20 of them in our yard. My parents used to pay me five cents to fill a coffee can with acorns picked up from the grass so they wouldn't sprout in their manicured lawn. In the fall the trees produced mountains of leaves that we had to rake up and dispose of. It was an arduous task. The fallen leaves are not colorful like those of a maple trees, but a drab brown and take years to decompose. In our suburban neighborhood with a quest for green lawns, the trees were unpopular. My parents as well as many of our neighbors were removing trees all the time to reduce the amount of yard work they produced in their suburban landscape. Everytime my parents cut another one down, I felt some regret, but only as an adult, with so many of these giant beauties disappearing from the earth do I feel the greatest sadness. There are still some of these trees in local parks, but with their slow-growth habits and the continued encroachment of suburban sprawl, I worry that the giants I knew as a child will cease to exist. So I will paint them as one paints the portrait of a beloved relative. This study will serve as a study for a larger work I hope to produce. If I could paint one life size, I would be most happy. This morning's little painting is 5x7 inches on a canvas panel. It is only occasionally that I paint on canvas panels, but they are light weight and are convenient for travelling. The challenge with creating work on a canvas panel is that they are not archival and are subject to warping. I only use them for practice. It would be awful to create a wonderful masterpiece only to find that the humidity has warped the painting and it won't sit squarely on a wall, in a frame, or on an easel. Usually I paint on gessoed hardboard panels or streched canvas. The hardboard panels are sturdy and can last a life time. While continued exposure to moisture can cause problems, these panels are much less apt to warp or lose their shape compared to canvas panels. They are my favorite surface for durability. The challenge with hardboard panels is that when paintings increase in size, the panels can become heavy and difficult to hang. Therefore, when I paint larger works, I work on stretched canvas which will also last a lifetime if properly cared for. Sharp objects can pierce a canvas and destroy work, but the lighter weight will make hanging much easier than a heavy hardboard panel. These are some ideas to keep in mind if you are beinning to collect art. A suggestion I will offer if you are considering buying art online is to purchase a small, canvas panel from an artist you like. They are usually less expensive and can give you a sense of the artist's work before investing in larger, more expensive paintings on panel or canvas. This little painting will probably go in the affordable art section of the Small Impressions Gallery at Etsy when it dries. These paintings sell fast because of their economy. They make great little gifts and give a good preview of the artist's skill before purchasing a larger painting. If you are interested in larger work on hardboard panel or stretched canvas, check out Impressions Gallery at 1000 Markets. Usually I prefer to paint in the morning when the light is good and I'm feeling fresh, but yesterday was an unusually busy morning and it took me a good while to get into the studio. When I finally made it to my little work station, inspiration was questionable. Then I remembered that there was a new challenge offered at Karin Jurick's Different Strokes Blog. Opening up the photo for the challenge brought a deep gulp to my throat--how was I going to capture all the frantic activity in the photo? After staring at it for a while, I opened it in my picture viewer and flipped the photo upside down. With it upside down, I couldn't dwell on how I was going to paint cars or buildings or trees. I just painted shapes and colors. When I was just about finished filling the surface, I flipped the photo upright again to see how close I was to the original photo. Surprisingly, though the results were a bit abstract, it did resemble the original. That's when I added a few telephone lines and called it good. Nothing like a good challenge to clear the head. Now I'm off to the studio again. Hope you have a very fine day.